Richard S. Slotkin does not work for, consult, own shares in or receive funding from any company or organization that would benefit from this article, and has disclosed no relevant affiliations beyond their academic appointment. On August 25 President Trump signed a directive reinstating a previous ban on transgender persons serving in the U.S. military, thereby continuing the perennial debate about the relationship between military service and social policy. In fact, as I found while researching the story of African-American soldiers and of immigrant recruits during World War I for my book “Lost Battalions: The Great War and the Crisis of American Nationality,” the armed forces have played a vital role in shaping American social policy toward the country’s minorities. The right to serve in the common defense has always been a fundamental civil right in the U.S. and a hallmark of full citizenship. Originally, the prerogative to serve in the militia was restricted to “freemen” or citizens. A few blacks had served in state and federal units in the Revolutionary War and War of 1812. But it was not until the Civil War that blacks were generally allowed to enlist in the federal Army. Between the end of Reconstruction and the start of World War I, the U.S. underwent a demographic revolution. Cities and industrial towns were transformed by massive waves of immigration. The arrival of large numbers of ethnic groups from hitherto untapped parts of Europe and Asia – groups whose language, culture and religion were strikingly alien – seemed to threaten existing cultural norms and social structures. At the same time, beginning in the early years of the 20th century, the “Great Migration” carried large numbers of black people out of the South. African-Americans became a national rather than regional minority. Fear and resentment of these newcomers generated a political backlash. The crisis produced by American entry into World War I brought these movements up short. Suddenly the nation had to raise an army of millions from scratch, with the utmost speed. There was no way to achieve that goal without enlisting large numbers of African-Americans and immigrants or “hyphenated Americans,” a derogatory term for immigrants first used at the turn of the century. It was in this crisis that American leaders rediscovered the ideals of civil equality that late 19th-century ethno-nationalism had called into question. The official ideologists of America’s Great War offered minorities a new social bargain: recognition as Americans in exchange for loyal service in wartime. Through the special Foreign Soldier Service, a military agency organized to provide language and civics classes for the foreign-born, the Army would become a school for citizenship. Organizations representing minority communities – the Jewish Welfare Board, Knights of Columbus (for Italians) and various black church groups – were invited to provide support services in the training camps. Over 350,000 African-Americans would serve with the American Expeditionary Forces in France. Units of the 93rd Division (including the “Harlem Hell Fighters” of the 369th Infantry) won distinction fighting as part of the French army. But most blacks were used as labor and support troops, and the combat units faced discrimination and mistreatment serving with the American Army. Once the war ended, racial and ethnic fears and resentments reasserted themselves. Jim Crow was violently reaffirmed by lynchings and racial pogroms, and in 1925 an Army report distorted the combat record of its black units to justify policies limiting the role of black troops in future conflicts. New policies of “race”-based exclusion were aimed against white ethnics too. The tone was set by Congress’ passage of the Reed-Johnson Act, restricting immigration by ethnic groups deemed undesirable – Jews, Italians, Eastern Europeans. Most Ivy League colleges adopted formal quotas limiting the number of Jewish students, and informal rules affecting Italian applicants. Real estate “covenants” barred Jews and other ethnic groups from purchasing or renting homes in certain towns or districts. However, the war experience had roused the political consciousness of racial and ethnic minorities. Black civil rights organizations cited their people’s record of military service in demanding an end to Jim Crow. New ethnic veterans organizations, most notably the Jewish War Veterans, were prominent in fighting for veterans’ benefits and civil rights. Blacks, Jews and other working-class ethnic groups gained influence as part of the New Deal coalition. The crisis of mobilization for World War II recreated the opportunity for social change that had been squandered after World War I. 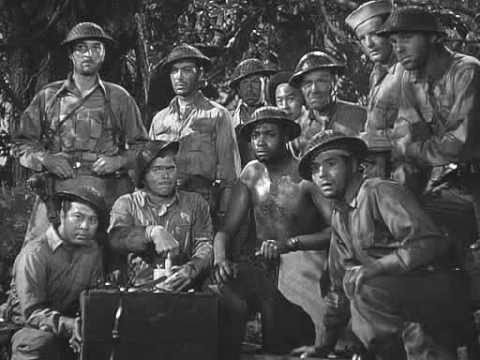 The pattern was set by “Bataan” in 1943, which symbolizes America in a small unit whose members include (in addition to some white regional types) a Jew, a Pole, an Irishman, two Filipinos and – most extraordinarily – an African-American. The U.S. Army was still racially segregated, but Hollywood deliberately set reality aside to create an ideal vision of an integrated America. It was this integrated vision that would shape post-war social change. White minorities were the first to benefit, pushing back against the patterns of discrimination that had barred Jews and Italians from employment, elite college admissions and housing. A new federal commitment to civil rights for African-Americans was signaled by President Truman’s 1948 decision to racially integrate all military units. As new laws (like the Civil Rights and Voting Rights Acts of 1964-65 and Title IX in 1972) have mandated the increased inclusion of hitherto marginalized or excluded groups in the mainstream of economic and political life, those steps have registered in the makeup of our armed forces. In a representation of today’s Army, a symbolic “platoon” would have to include many more African-Americans and Latinos, Asians of different national origins – and also women, and gays and lesbians. Similar objections were raised to the integration of women, gays and lesbians into the military. Nevertheless, in these cases military leaders achieved integration without loss – and indeed, generally with an enhancement of military effectiveness. In the mass armies of the two World Wars, inclusion was mandated by the sheer size of the force. Now that we have an all-volunteer military, the requirement of inclusiveness is, if anything, greater, because force size and the mix of specialists cannot be augmented by mass conscription. Editor’s note: this is an updated version of an article originally published August 7, 2017.